Since December 2008 I’ve been attending monthly raw potlucks here in Las Vegas. Erin and I hosted one at our house a few months ago, and we’ll be hosting another one in August. Typically 20-25 people will attend (I’ve seen as many as 35), so these potlucks are a nice way to meet local raw food enthusiasts and to sample a variety of tasty items. At previous potlucks I’ve brought guacamole, nori rolls, and garlic “bread,” but by far the most popular item I’ve made was a raw fruit pie. I’ve brought raw pies to three potlucks, and I always brought home an empty pie plate. People always compliment me on how good they are. Raw fruit pies are very easy to make. Depending on what kind of fruit you use, it can take as little as 20 minutes from start to finish, including making the crust from scratch. And it’s a lot healthier for you than a typical cooked pie. I want to credit Jennifer Cornbleet for getting me started on the path to raw pie nirvana. I began with one of her blueberry pie recipes and have been gradually tweaking it to make other fruit pies. 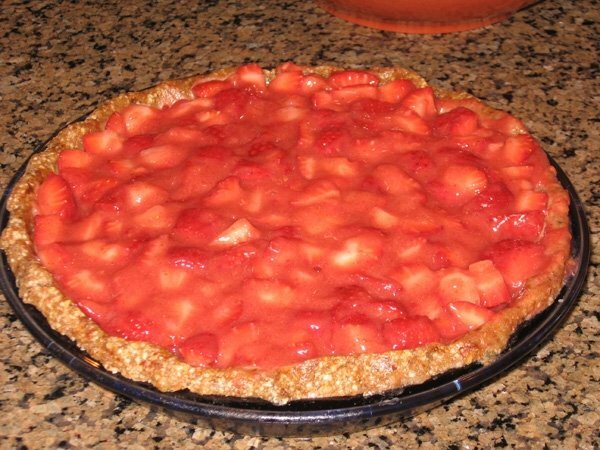 Here’s a photo of a raw strawberry pie I made, so you can see what the end result looks like. This one took about 30 minutes to make from start to finish. I made it for a raw potluck, and it quickly disappeared. Making a raw pie crust is easy and only takes about 5 minutes once you get the hang of it. There are lots of variations on how to do it, so I’ll start you off with one of the simplest. Put the raw nuts in a food processor, and blend with the S-blade until the nuts are reduced to small crumbs. (This will be very noisy when you first turn on the machine.) Add the dates and salt, and blend again until there are no more chunks of dates. The end result should look like loose crumbs. Pour the crumbs into a 9-inch pie plate, and use your hands to press them into the form of a pie crust. It may take a little practice to get it to look symmetrical, but it isn’t difficult. I usually start by pressing straight down to get the bottom flat, and then I press around the sides as I turn the pie plate. You can make the pie crust flush with the top of the pie plate, or you can create a lip around the edges. The strawberry pie shown above has a lip; the other photos show pies without the lip. Sculpt it however you like. Put the pie crust in the freezer for about 15 minutes. This helps it become more firm and solid. Fortunately this is just enough time to prepare the filling. There are countless variations on the ingredients you can use to make the crust, but generally the best place to start is with raw nuts and some kind of chewy dried fruit. Instead of dates you can use raisins or figs. I suppose you could even use dried apricots, but I haven’t tried that one yet. The salt is optional, but I find that a little salt in the crust makes for a nice contrast to the sweet fruit mixture that will fill the pie. You can also add some spices like cinnamon or nutmeg. If you like the taste of coconut, try adding some shredded coconut as well. As a side note, if you’re strict about using truly raw ingredients, then you should know that many nuts that are labeled raw are not actually raw. For example, thanks to the (idiotic, paranoid, and otherwise dumb) ruling of the California Almond Board, California almonds have to be pasteurized by law. This means that the nuts are heated/cooked at temperatures well above 110 degrees. In my opinion it’s totally unethical that they should be labeled and sold as raw nuts when they are actually cooked, no longer a living food, and nutritionally not the same as raw nuts. I’ve read that roughly 98% of the almonds sold in the USA come from California, so if you buy raw almonds from a grocery store in the USA, they’re probably not raw. Lately I’ve been using raw organic almonds which are imported from Spain. These Spanish almonds are larger and more flavorful than the California almonds, and they make a better pie crust too. It’s unfortunate that I have to get my nuts from 5500 miles away instead of 55 miles away, but I’d rather use the best ingredients available. I’d be happy to help out the (crashing and burning) California economy since California is my birthplace, but I can’t help them if they’re going to make stupid choices like cooking their nuts and trying to sell them as raw. I doubt that the deep cuts in education they’re planning will improve their vocabulary. Cooked and raw are not synonyms. Nor are actor and governor. 6 cups fresh fruit such as blueberries, strawberries, cherries, peaches, apples, etc. Blueberry pie is the easiest to make because the blueberries don’t require any prep work other than washing. If you’re using larger fruits, you’ll need to cut them into smaller chunks. If you’re making strawberry pie, cut off the stem part, and cut the strawberries into quarters (into sixths or eighths if the berries are very large). For cherry pie, pit the cherries and then quarter each cherry. For apple pie, cut the apples into thin slices or small chunks. Put 2 cups of the fruit, the lemon juice, and the soaked dates (minus the soak water) into a blender, and blend until you have a smooth liquid. Put the remaining 4 cups of fruit into a large bowl, and pour the blended mixture over it. Mix it together. Take your pie crust out of the freezer, and pour the fruit mixture into it. Use a rubber spatula to spread the filling into the crust. Voilà! Your pie is done. You can actually eat it right now, but it’s best if you refrigerate it for at least an hour or two. The blueberry pie is easiest and tends to come out best because the blueberries hold their moisture well. If you use strawberries or other fruits and cut them into small pieces, they’ll release some of their moisture as the pie sits in the fridge, so the crust will become wetter. This isn’t a big deal for my family because our pies rarely last more than a day anyway. You can make pies with frozen fruit, but you’ll need to thaw and drain the fruit first. Personally I prefer fresh fruit pies. One time I made a blueberry pie for a potluck with organic frozen blueberries, and everyone still loved it. Use your imagination to create different flavors and textures for the filling. You can add other ingredients to the sauce, like adding cinnamon for an apple pie. You can also mix and match different fruits. For example, you could use a strawberry sauce for a blueberry pie and vice versa. 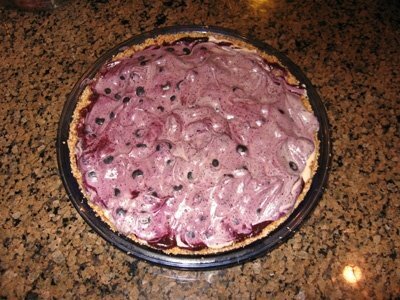 Here’s a photo of a blueberry cream pie I made. I began with the original blueberry pie recipe, and then I made a cream sauce from soaked cashews, soaked dates, water, and vanilla (I think). I used a spatula to swirl the cream sauce into the pie filling. This one was actually a little too rich for my tastes. The final photo is a slice of raw cherry pie. Erin and I made this on Saturday using fresh cherries. Erin used a cherry pitter to pit the cherries while I made the crust. Fortunately she managed to snap a photo of it on Sunday before it was all gone. 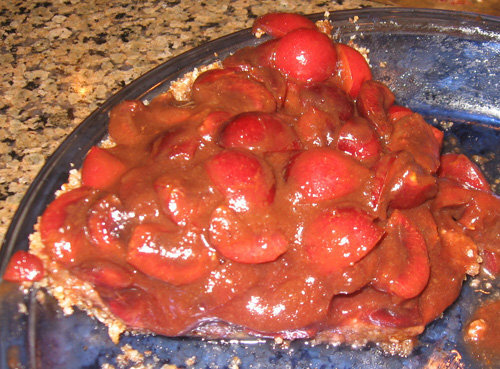 This pie tasted better on the second day because the cherries weren’t as tart. These pies are so good that you can even eat them as a meal. After all it’s just fresh fruit and nuts. My daughter Emily and I ate some of this cherry pie for breakfast yesterday. Have fun, and enjoy the pies!